While i opened my store, suddenly there's a box, a big box with lots of cassette inside it. And i found a very old cassette.. i bought it when i was in form 1 or 2. It's 1987 Whitesnake album. Miracle happened, i also found a very old photo of mine with whitesnake t-shirt (Slip Of The Tongue cover)... if i not forget, i will upload it later...i remember it.. it's during i'm in form 1... How i really miss the old days. Rock back those days, never want to fall in LOVE.. wow.. really stubborn all of us. Whitesnake really popular during our time.. when peoples listening to Rap music, we listening to thrash metal and more heavier stuff.. 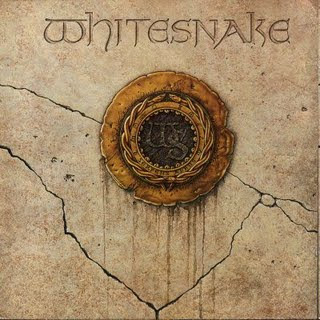 But whitesnake a hardrock band fronted by Dave Coverdale (ex Deep Purple). One song i really love and maybe most of you gonna love it is, Is This Love. "Is This Love" is a power ballad by Whitesnake, from their self-titled album, released (as per the alternate album title) in 1987. Written by lead singer David Coverdale and guitarist John Sykes, the song was rumored to have been originally intended for Tina Turner. The song became one of the biggest hits in 1987, and it further defined Whitesnake as one of the premiere rock groups of the 1980s. It reached number 2 in the US singles chart, and number 9 in the UK Singles Chart.